Today’s the day hundreds of intrepid bloggers reveal our Themes for the April A to Z Challenge. Click here for a link to other bloggers who are revealing their themes today. 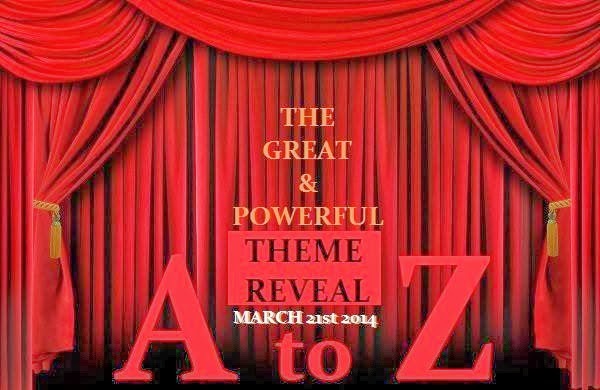 It was harder to select my theme than to prepare my A to Z posts. Telling myself this would be an opportunity to experiment with a new writing style, I considered flash fiction, six sentence stories, and even haiku poetry. You’re an A to Z Challenge virgin. So, as unimaginative as it sounds, my theme is Objects: From A to Z.
I can’t think of any way to glam up my theme. Or make it mysterious. Or humorous. Or enticing. Ironically, my A post on April 1st won’t be about objects at all. But it might be glam, or mysterious or humorous or enticing. That’s what I know. Good luck! I’m sure you’ll do great. If you’re looking for support, we have an FB group set up for the challenge. Thank you, Corinne. I will look into the FB group, and look forward to reading your A to Z’s! Don’t beat yourself up..keeping it simple is the best advice. Advice I wish I could follow…I had to over complicate mine, but I’m happy with it and that’s all that matters. Best of luck to you. Yes, that’s what matters!! You have to be satisfied with your own efforts. Thank you for visiting. I’m going to visit you and see what “over-complicated” looks like 🙂 I have a feeling I will enjoy it. Thank you. You’re too kind!! We all need the love, huh?! Are you on WordPress? The colored text is one of little those links above where you type your post in “draft mode”. You know, where the “add media” and other links are. Good luck! See you soon. Thanks, Marci – maybe your “ladies” will be able to use some of my objects 🙂 i have enticing, mysterious and humorous covered in my A to Z. Hope I’ll get some “glam” inspiration from your writing! Looking forward to reading your posts, Sammy. Keeping it simple sounds good to me. Qualities is in simplicity. See you around. Thanks for visiting, Silvia. Can’t wait for all things Romanian! Hi Sammy! Your site looks great. I liked your about page. Do you have social media accounts? Facebook Page, Twitter, or Google+ for example. I couldn’t find that information. I like to add the persons link when I share their work. If you do I’d put them on your blog before the A to Z Challenge kicks off. Your post Thanks, But No Thanks had me laughing. Good luck. I’ll be back to see what you share in April. Thanks for stopping by. This is such a good project for me – learning more about the discipline of writing and meeting such talented, friendly bloggers. April will be a lot of fun. M. J. – thank you for all your support. I was kidding – of course I am thrilled to participate in A-Z. The hardest part will be wanting to linger on sites at the same time I want to visit everyone! There will be some that require time and thought – better not to race through just to read all of them. It’s just a terrific project to be part of. See you in April! And I still don’t get what that theme-thing actually is about. Next! For example! Day one you write about apples. Day two about bananas. Day three about… ehhh… c… csomething… ?????? I understood it earlier as if it had something to do with the blog theme! No wonder I didn’t get it together. Thank you for explaining. No wonder you were confused. Now you have it! Lots of us newbies here! 🙂 I’m sure you’ll be fine. Looking forward to your posts. Thanks, Debbie, for stopping by. It’ll be fun to see how we all do. Thanks, Raquel. Some letters flowed easier than others. Probably that way no matter what the theme. I look forward to your April posts. That sound mysterious now 😛 Looking forward to your unique posts! 🙂 i have 5 more letters to finish, then it’s “step back and look at the big picture” to see what the whole alphabet produced. I kept them simple, and short, but hopefully worthwhile snippets. SammyD – whatever you choose as a theme, it will be a delight because your sunny personality will shine through and we will be entertained as we always are when we come here! Now relax, dear virgin. It won’t hurt…much 😉 You’ve got your co-hosts on your side, and you know you’ve got me, so no fretting and be proud of your choice! Thanks, Coach :-). I didn’t like my “A” choice and was bummed about a so-so beginning. Had an inspiration today so rewrote it and now, with my glass of wine, I’m feeling fine. Plus knowing others made it through losing their virginity and came back for more !! You’ve got me curious about your theme already, so it is mysterious! I am new in this blogging challenge, so I hope I’m doing this right. I put my email in your “follow by email” box. So I’ll be following your posts, right? Hi – yes you are on my list as a follower, so you should see my posts. My next post will be Monday morning; just holler if you don’t see it! Plus I’ll be visiting you. Thanks for stopping by; we’ll have fun getting through the challenge together. Sorry, I’m trying to ‘undo” the mistakes in the signature, but it’s not working. No worries. I make tons of mistakes or push wrong buttons. There’s no white-out bottle here to erase stuff, huh!?! Hey, thanks for stopping. I thought your muse was fascinating – doesn’t cut you any slack! Sort of like we can be to ourselves sometimes, eh. I will swing by next week to read your alpha’s. Objects are a great theme, especially for the first time doing the challenge. Have fun with it! Thank you for your encouragement. I am so looking forward to a month of April reading articulate creative works by our world of bloggers. Thank you so much for your encouragement and generous offer to help. Everyone who has participated before is so enthusiastic that I know I will have a very positive experience. Your blog alone is going to elicit reflection every day. I’ll probably still be reading everyone’s in October! the first AtoZ seems daunting at first but it’s a lot of fun. It’s good to go with a generic theme for the first one. You could write about toast and it would be awesome. Speaking of which, I love toast, wouldn’t mind seeing a post about it… just saying. “T”oast. Good luck!! “T”oast – I will be toast if I don’t get my “J”, “N” and “P” posts figured out 🙂 Raisin toast? What kind of toast do you have in UK? Sounds like you have a theme that can as creative or simple as you want- so many objects to choose from! The posts are turning into memories triggered by objects – i didn’t plan it that way, but have enjoyed the memory triggers! There is no way for me to pick a theme. Zenkatwrites can’t be pigeonholed. I WON’T!!! Besides, they didn’t warn us of this huge decision when they asked us to participate . . .
You Go, Girl! Every which way but towards a theme. The No-Theme Theme. Sammy D. I like that name– The No-Theme Theme. Thanks for the giggle. You’ve got half the battle won if you have a theme and are keeping it simple. Objects are not in themselves interesting– it is the perspective of seeing them, their history or their potential future that make them so. All the best for AZ! Thank you for your comments, Damyanti. Sometimes we’re too close to our own theme to see that perspective. Plus writing is like any other skill or art – the more I do it, the better it will flow. A to Z is such a great forum to practice that. I agree. I find that to be true when ‘m writing a story and when I attempt painting a picture. Get too close and I’m blind. Simple is good. Especially with so many bloggers joining in–it will be refreshing! Thanks, Gail. We all have an interesting month ahead of us! I wonder if any of you are as worried about this challenge as I am. Sammy, you are new this year, but you seem prepared. I know it’s supposed to be fun, but I also realize that if I want to gain new followers to my blog, my posts have to be at least semi interesting. A writer friend advised me to start working on my posts in advance (she told me this last January), and I fully intended to do so, but I wanted to finish up a few things first. I’m still working on that finishing list. 🙂 So, I have all of one post prewritten and the rest will have to come off the top of my head. My excuse? I’m very new to this and did not schedule in any time except for the month of April. Yet I now read blogs like this one, Sammy, and think, Oh, I am really in trouble here. Why was it that I never started working ahead last January? Yikes! Well, I’m in it feet first or head first now, so I hope I can keep up with you all. I will most certainly be back to this blog. See you all in April. Thanks for the visit to my blog! Objects that may not be objects after all… mmmm… glam/mysterious/humourous non-objects… wonder what that could be? I suppose I’ll have to just wait and see, hey? Patience is a virtue. Or so I’m told. Hope it’ll be wirth the wait. Thanks for visiting, and I’ll greet you on the A to Z trail next week! Good luck with your first Challenge! You’re going to love it. And you should definitely sign up for the IWSG too! Thank you for your visit and support! I look forward to visiting often during April all around the blogworld – so many talented writers, photographers and artists.